This winter hasn't feel like winter for the past couple weeks and I couldn't be happier. It's really nice being able to go bare leg again, but on the other hand, the weather changes by the minute. What starts looking like a chilly morning, becomes a sunny 50 degrees day, and suddenly have worn a chunky knit sweater feels like a bad choice. What I like to do during these crazy days is to mix and match cozy pieces with other pieces that you usually would wear on a sunny day. 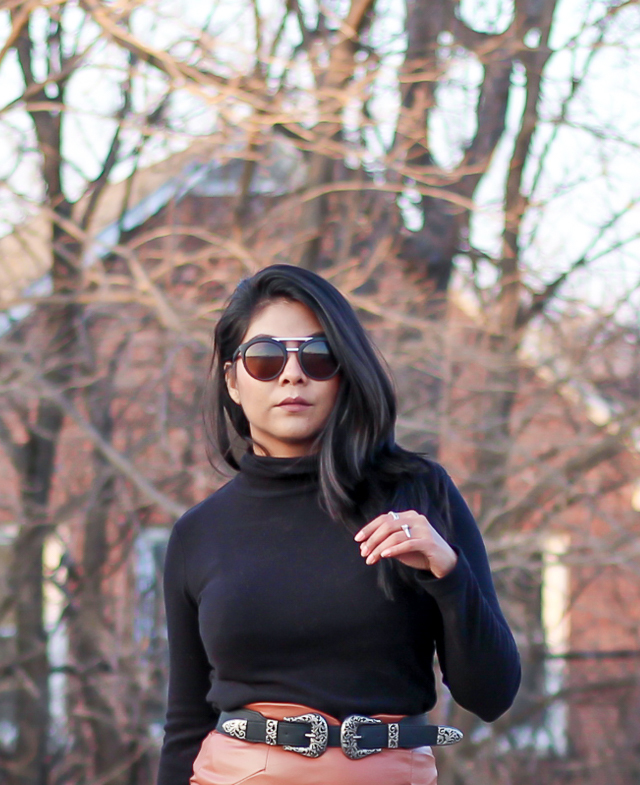 This time I worn a turtleneck top with a faux leather midi skirt and finished the look with a double buckle belt and booties. By the way, do you remember THIS SKIRT? It was on the blog last year, but then I forgot about it. I recenlty found it again and I've been wearing it a lot lately. Este invierno no se ha sentido como invierno para nada, no solo porque casi no nevo, todavia no me puedo creer que haya podido usar un vestido sin medias en medio febrero! Lo unico malo es que el clima cambia de un minuto a otro, lo que empieza siendo una manana fria se convierte en un dia soleado y caluroso por la tarde, y de repente haberte puesto un sueter grueso te parece una muy mala decision. Lo que a mi me ha funcionado mucho en estos dias es usar una combinacion de entre prendas calientitas con otras ligeras, como por ejemplo en esta ocasion que combine una falda de "cuero" con una blusa de manga larga y botines. Por cierto, se acuerdan de esta falda? Estuvo en el blog hace tiempo, y habia olvidado que la tenia, la acabo de encontrar de nuevo y la he usado muchisimo ultimamente!